Americans at both ends of the political spectrum are polarized on climate issues, and their differences extend to how well they think climate scientists understand climate change, how much they can trust information from them and what they think influences their research. Conservative Republicans are especially skeptical of how well climate scientists understand climate change and are particularly likely to distrust information from them, according to a new Pew Research Center report. They also are among the most dubious about the influences on and motives behind climate research. Those in other political groups, including moderate and liberal Republicans, are far less skeptical and distrusting. Many conservative Republicans have a negative view of scientists’ understanding of climate change. 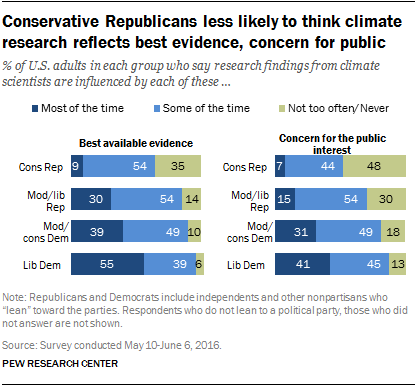 Majorities of conservative Republicans say climate scientists have little or no understanding of the causes of climate change or ways to address it. In comparison, majorities of the other political groups, including moderate and liberal Republicans, say climate scientists understand the causes of climate change and ways to address it very or fairly well. Conservative Republicans are closely divided over whether to trust information from climate scientists: 55% trust information from climate scientists at least some, while 45% have little or no trust in information from climate scientists. 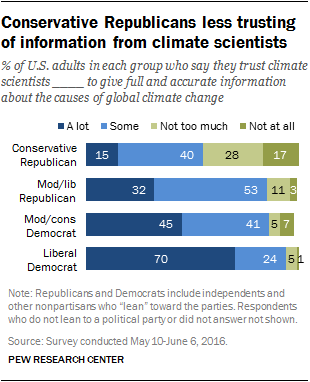 In contrast, just small minorities of those in other party and ideology groups do not trust information from climate scientists. Climate scientists are not the only ones in whom conservative Republicans have low trust on the issue. Majorities of conservative Republicans say they have “not too much” trust in elected officials, energy industry leaders and the news media – or trust them “not at all” – to provide full and accurate information about the causes of climate change. Many conservative Republicans express doubts about whether the work of climate scientists is based on the best available evidence. Some 35% say scientists’ research findings on climate are not often or never influenced by the best available evidence. But only 14% of moderate and liberal Republicans and 8% of Democrats agree with this view. Conservative Republicans are more doubtful than others about motives behind climate research findings. 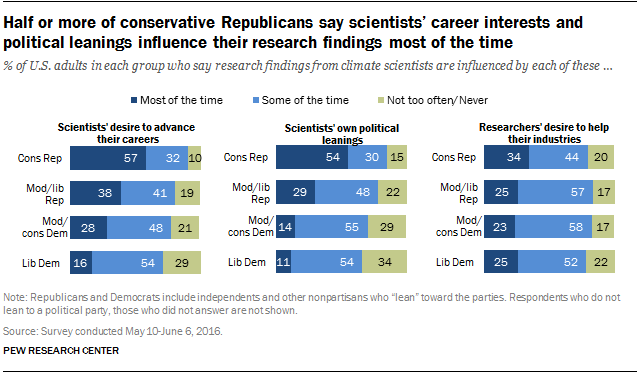 Conservative Republicans are particularly likely to think research findings from climate scientists are influenced by the desire of scientists to advance their own careers and by their personal political leanings. About half or more of conservative Republicans say each of these two factors influences research findings most of the time. Minorities in the other party/ideology groups say either of these influence research findings most of the time. Still, one area in which those throughout the political spectrum are largely in agreement is that climate scientists should have a seat at the policymaking table. 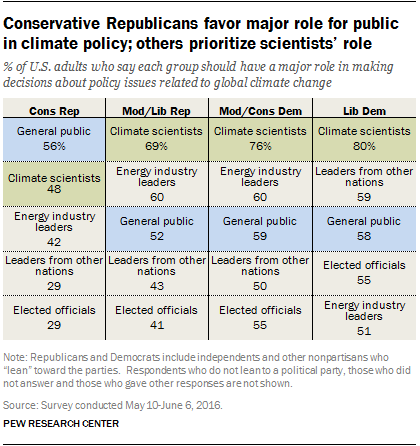 About half of conservative Republicans (48%) say climate scientists should have a major role in climate policy decisions; an additional 36% say they should have a minor role. Large majorities of the other political groups also say climate scientists should have at least a minor policymaking role. But, comparatively speaking, conservative Republicans prioritize a role for the general public in policy decisions about climate matters. A 56% majority of conservative Republicans say the general public should have a major role in climate policy matters. Those in other political groups, including moderate and liberal Republicans, put climate scientists at the top of their list of who should play a major role. Fewer Americans say elected officials and leaders from other nations should have a major role in climate policy decisions, compared with other stakeholders. Conservative Republicans are particularly likely to say elected officials and leaders from other nations should have no policymaking role. About three-in-ten (29%) among this group says leaders from other nations should have no role and one-fifth say elected officials should have no role.